I have less than 6 hours to explore Kochi. No, this post is not about what you can do in 6 hours in Kochi. This is about all the goof ups, the impromptu wanderings, the under whelming and overwhelming bits of the bustling city. I have my mental must dos jotted in my mind: the Jewish synagogue , the Dutch palace, Fort Kochi and without a doubt sunset by the fishing nets. ( courtesy the stellar images I saw in a travel magazine). And honestly there is no dearth of Kerala tour packages that entice any traveler to visit God’s own country! But Mr. Jenev parked the car outside a traditional Malabari mansion. This wasn’t part of the mental list of to- dos but we hopped out. Good decision. The next one hour was spent absorbed in Kerala’s rich history and culture. The Kerala folklore museum is a three storeyed museum built on the lines of a Malabari mansion (made up of rosewood, teak and metal) with artefacts from all over the state. From ancient relics, sculptures, wooden canoes, to brass statues and more. You walk through the costumes of the Kathakali dancers and get a glimpse into their lives. Jewellery of Theyyam dancers, ancient scriptures, coins, masks and every tiny nitty gritty of Kerala is exhibited here. I only wished the lighting was a little better. Some of the sections were very poorly lit. Even though there is an entry ticket plus an additional charge for photography, the lighting isn’t conducive to photography. Some relics are displayed brilliantly, some are simply stowed away. But the visit is absolutely worthwhile. For its traditional Malabari feel and timeless treasures of the Keralite culture. For the shoppers, there is a shop inside as well to buy souvenirs including the traditional Kerala Kesavu sari. Kala and me loved this place (she for her love for interiors, me for my love for architecture). Our next stop is Mattancherry. I have extremely high hopes from the Dutch palace of the Mattancherry palace, but I am left a little underwhelmed. The murals are fantastic,the wooden roof catches my attention and so do the lovely windows, but there isn’t really anything to write home about. Photography is prohibited and the entry fee is Rs.10 per person. This is just one picture I clicked at the exit. And just when I was wondering how and where would I be able to click the essence of Kochi, the Kochi Biennale answered all my queries. The Kochi Biennial is an annual festival dedicated to art held in December-January across the city. Tucked away in the bylanes of Kochi, we stumbled upon great art displays, perfectly blending with the charm of the Jew town. A melting pot of so many cultures: Hinduism, Islam, Christianity, Portuguese , Dutch, Jewish, Kochi has a bit of everything. Aromatic flavours and scents at local spice shops to tiny stalls stocking curios like brass compasses welcomed us as we entered the Jew Street. The place has a unique, vibrant vibe with antique shops selling wooden and brass handicrafts, fancy boutiques, chic art galleries, cozy, extremely inviting cafes and furniture shops. Some of the shops were nothing less than museums, with palatial pillars and traditional jharokas. All this spiced up with splashes of yellow and blue on the walls and the occasional yet very welcoming sightings of the Kochi Biennale artwork. In this riot of colours, the window lover in me spotted graffiti on walls and idyllic windows overlook the extremely busy Jew Street. We got so busy photographing this street that by the time we reached the Jewish synagogue, it had closed. ( 10 mins late to be precise). So pro tip: Remember that the Jewish Synagogue opens from 10 am to 1pm and 3 pm to 5 pm from Sunday to Thursday and on Fridays from 10 am to 1 pm. It was time to catch the sunset at Fort Kochi and get the customary shot of the sun hiding behind the fishing nets. We rushed, whizzing past colonial buildings, a street thronged by foreigners relishing sea food and quaint bungalows to reach the Fort Kochi beach. The touristy fervour of the beach was evident with hawkers lined up selling any and everything. The beach was extremely underwhelming and I earnestly wished it could be cleaner. Fishermen with the Chinese fishing nets, boats perched on the shore and scores of ships cruising far away in the distance. I searched for a vantage point where I can get the nets against the setting sun and for that I hunted for a boat to hop on. On finding one, I climbed onto the rickety wooden planks, only to be stopped by a fishermen informing me politely that it is a private property. So a deal was struck : 100 Rs. For being on the boat to click pictures. Not much you can do when the sun is all set to bid adieu. I stood there at the far end of the boat, clicking the sun through the nets, when suddenly I heard a noise. The whirring of a motor and shouts of the fishermen. “Ma’am, be there. Don’t move!”. Before I can understand what is happening, I see them rushing ahead of me as the net is raised far up with an enormous catch. I smile feebly. Yeah lucky for you, unlucky for the fish. I sigh. The sun is gone. The sea is silent. As we make our way to Hotel Abad Atrium, I promise to come back again. My Kochi Diaries are far from complete. But for now, there are these stunning takeaways from the streets of this vibrant city. P.S: Did I tell you how hard Mr. Jenev laughed when I told him I searched for a fort in Fort Kochi? Disclaimer: My trip to Kochi was made possible by Kerala Tourism. The views are my own, as always! More than the photography I guess it is a place to learn about history and get connected with the works of artists. Sometimes, not having to-dos is the right way to go…it removes any biases! Absolutely Alok. But the streets are great photo ops. If you love markets, there are ample opportunities to click! I can imagine, we had a similar time in Portland here. That was a pretty quick trip. Lovely frames from Kochi. Apparently there was a fort in Kochi. Presently, a small wall or two remains near the beach. Yes it was known as Fort Emmanuel and was built by the Portuguese until the Dutch came and destroyed it. There are now remnants of it at the beach. It was a very short stay but a very memorable one:) loved Jew town and its chaos 🙂 will surely visit again Johann! Even as a Kochi-ite, I am yet to explore the various opportunities that the city has to offer. Lovely pics and write up, as always; but then again, this was close to home. You know Divsi, reading this post I realized yet again, how much a seasoned traveller like you sees and how little I saw!! You do have this amazing capability to capture the essence of any place in whatever little time you get! Indeed the heart of any new place lies in its mundane streets. Wish we had more time to explore Kochi especially the Biennale. It sure had some spectacular displays! Loved your lively narration, took me back to the trip! Thanks so much Rashmi:) Have you documented your visit? would love to read! Ah I am just back from Kochi where I went for the Biennale and fell in love with Kerala and it charms – the food, people and the streets!!! Thank you making me relive them all in your pics. I think my May blogging will be all about Kochi as I have tonnes of pics to share from there alongwith a plethora of anecdotes and love!! I have stayed in Kochi many times but never really got the chance to explore the place. I will have to go there again, this time just for holidaying. There is lot to see in Kochchi and you have covered it beautifully in your short time . Such lovely captures. I have been to Kochi and I fell in love with it. And your pictures actually show a lot of the Kochi I remember. Your pictures are gorgeous, never mind the poor lighting! 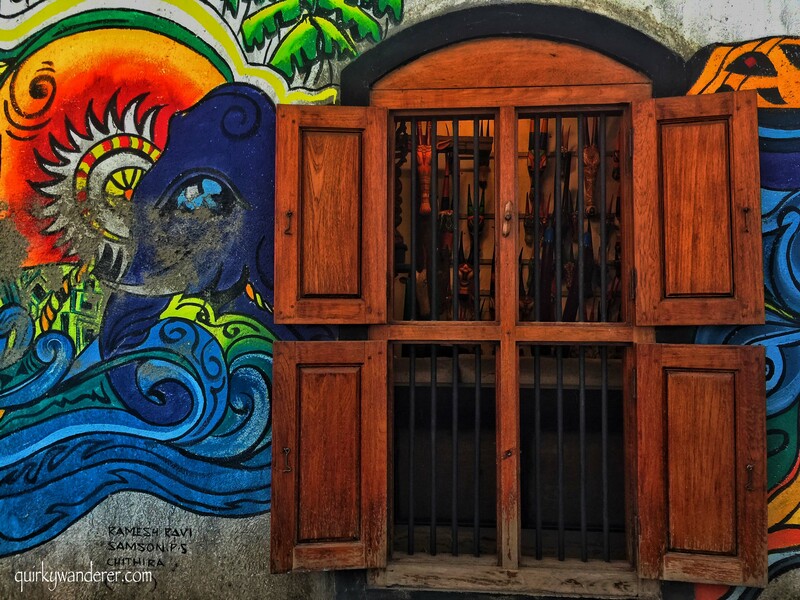 I loved my visit to Fort Kochi too, and your post has brought back some lovely memories. I agree, the shops on Jew Street are picture perfect themselves! Sometimes, it so happens that we discover such gems when our original plan just gets screwed! Happened a couple of times for me too! The Folklore museum and Malabar Mansion is so gorgeous!!! Totally my kinda place… And yeah, as you say, not just Kochi, whole of Kerala is a melting pot of so many cultures and they live in peace with such strong presence of 3 major religions.Too bad you missed the synagogue. Your photograph with the fishing nets is just perfect! That’s an amazing, bustling with colors city – I love places like that, full of life, and very authentic. And it’s good to go a bit off the beaten path, I always try to do it 🙂 The museum and Malabar Mansion are spectacular! Must visit! Kochi is one of those cities which has the city life and the typical coastal life at Fort Kochi. Even I had a very little time to explore when I was here. Didn’t know about the folklore museum. I loved your pictures of this place! A wonderful post and I must say that you caught good glimpses of city in 6 hrs. Whole Kochi seems to be so bright and colorful. I loved your shot of sunset. I have not been to this part of India, but will surely added it to my bucket list. It looks like you got a lot done in 6 hours I must say! Nicely done! Wonderful array of Kochi photos, qw with the bright colors, Indian relics, and busy streets. I especially enjoyed the fish net photos and story. Thanks for sharing your adventure. What a beautiful place, so full of colour! That’s a pity that you couldn’t make it to the synagogue, but still, you got some great photography on the way! I especially loved the wooden constructions, hope to visit one day! I have been to Kochi twice and still miss some of the places mentioned by you. Fort Kochi is like a time warped town. In both my visits, I have enjoyed taking long leisurely walks on the streets of the little town. I enjoyed watching Kathakali performances at Kerala Kathakali Center and Greenix. Awesome post about the Kerala Tourism. Whole Kochi seems to be so bright and colorful. I loved your shot of sunset. I have not been to this part of India. Lovely details in every picture. I am yet to visit Kochi and I have such high hope from the place.